Our first meetup was a tremendous success! We had our first meetup last night – “Azure IoT Hubs, Raspberry Pi and Node.js with Pete Gallagher of PJG Creations at the Minor Oak” – and it was a tremendous success! The room all set up while the Attendee's eat some tasty pizza in the meeting room at the back. Thanks very much indeed to those who were able to attend and we hope you enjoyed the evening and learnt a lot in the process. Please do feel free to feedback any thoughts you have on the evening, parts you think went well, or parts that could be improved upon. We’ll be sharing links to the slides and hopefully the videos in the near future, so watch out for them…. Don’t forget to delete any Azure resources you may have spun up on the evening, as some of the services carry a small ongoing charge which will eat up your promotional credit. It’d be fantastic if you could share your experiences, photos etc of our meetup on social media, as we’re keen to expand our audience so we can attract some more speakers to our events, along with sponsorship so we can continue to provide the space, food and drink. 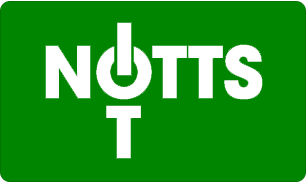 Our Twitter handle is @nottsiot, we’re on Facebook at https://www.facebook.com/nottsiot, our Co-Organiser and Speaker Pete Gallagher’s Twitter handle is @pjgcreations and our venue owner Dee’s Twitter handle is @minoroak. PJG Creations Ltd – https://www.pjgcreations.co.uk – Who have provided the Web Site, Social Media presence, Logo Design, last night’s talk and the equipment. Minor Oak Co-Working – https://www.minoroak.com – Who so very kindly provided us the excellent space, the tasty beer and the delicious pizza from a local restaurant Pizza Storm – http://pizzastorm.pizza. Finally, keep your eyes peeled for our upcoming meetups… We’re in talks with some quite exciting speakers for future events! Thanks and see you all again soon. IT Solutions - Desktop & Web Applications.